It makes my day when I learn about a first-to-market gluten-free product. I experienced that last week when I found out about Feel Good Foods' line of gluten-free handmade Asian dumplings, which come in four varieties: vegetable, chicken, pork and shrimp. 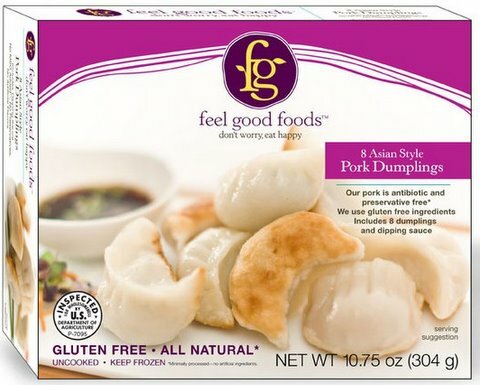 The dumplings (eight per box) contain all-natural ingredients with no MSG, artificial flavors, preservatives or additives, and are accompanied by a wheat-free tamari dipping sauce. The husband-and-wife owners of Friedman's Lunch, located at New York City's Chelsea Market, are the brains behind Feel Good Foods. (We ate at Friedman's during a visit last year to the Big Apple.) If you live in or are visiting Manhattan, the dumplings are now available for purchase at the restaurant (75 9th Avenue, 212-929-7100) and at natural foods stores in the city. Look for them soon at markets in the Delaware Valley and online at the Gluten-Free Mall. Thanks to Gwinnett (Ga.) Gluten-Free Examiner Jennifer for the tip. Just a note for anyone who also needs to avoid soy protein. I contacted the manufacturer to confirm there was no soy protein in the pork or shrimp dumplings, as chicken and vegetables both listed it in the ingredients. They responded that they just revamped the recipe, none of the dumplings contain soy protein, and they have corrected their website accordingly. Soy oil is still an ingredient, not the soy protein. Of course, the sauce contains soy, but you can make your own with Coconut Aminos (Coconut Secret) and rice vinegar. Thanks for posting about this product. I am very excited to try to find it for my son. B/T/W, I met you at our local "Weggies" approx a year or so ago. Thanks for handing me your card. Your blog has been very helpful.